This is the view from White Sands, New Mexico, where Leo will rise on November 3rd at approximately 3 am. 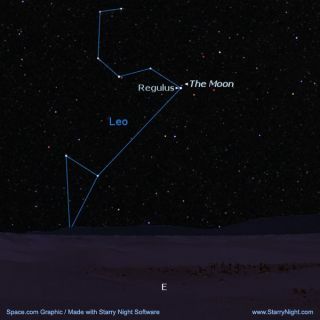 The moon will be sneaking up on Regulus by 3:30 am. If you're further west, start looking earlier; if you're further east, you can sleep a little longer. If you live in the southern or western parts of the United States, you'll have an opportunity on Saturday morning, Nov. 3, to see a fat waningcrescent moon gradually drift toward and ultimately hide the 1st-magnitudestar, Regulus, the brightest star of the constellation Leo, the Lion. This event is called an occultation, a word that is derivedfrom the Latin occultāre which means literally "to conceal." Andif you are fortunate enough to live in the zone of visibility for this event(see below), that's exactly what you will see on Saturday morning; the moon,appearing to temporarily conceal Regulus from your view. Because the moon iswaning, its bright crescent faces forward as it advances eastward against the starrybackground. Regulus will thus disappear on the moon's bright limb and even abright blue-white diamond such as this might be briefly overwhelmed by theglare of the lunar surface some seconds before it vanishes. How well you seethe moment of the star's disappearance will depend a lot on the size andquality of your telescope and the steadiness of the atmosphere. On the other hand, the reappearance of Regulus will happenon the dimly earthlit dark limb as the moon leaves the star behind. Here the scenewill be much more dramatic. Those blessed with a dark sky background will seeRegulus suddenly and dramatically "pop" into view, as if a switchwere thrown; a stunning demonstration of the moon's orbital motion and thestar's tiny angular size. Binoculars ormaybe even just your eyes will be all you'll need (though you might need toblock the glare of the moon's bright limb behind a nearby wall or tree limb). If you live anywhere to the south of a line that curvesroughly from near Gold Beach, Oregon, across the U.S. to near Savannah, Georgia, you'll see the moon pass in front of Regulus. If you live north of this line, you'll seethe moon slowly glide below Regulus, resulting in a tantalizing near miss! Andif your neighborhood happens to lie fortuitously within about a mile or two oneither side of the line, you might have an unusual opportunity to see thegrazing occultation of a 1st-magnitude star. As Regulus appears to move tangentto the moon, it might just disappear and reappear a few times along the ruggedterrain of the moon's bright limb, just off to the left of its upper cusp. Another important consideration is whether the occultationoccurs against a dark sky, a twilight sky or a daytime sky? Over California and the Desert Southwest, the entire eventwill occur in a dark predawn sky. Across Texas, Oklahoma and most of Kansas, Regulus willdisappear in a dark sky, but it will reappear during early-to-mid morningtwilight. Over the Deep South, Piedmont, Southeast Coast and Florida, morning twilight will be well advanced and the sky quite bright when Regulusdisappears; in fact the sun will have just risen along much of Florida's east coast. And the star's reappearance will take place after sunrise for much ofthis region. A detailed set of predictions for over 100 selected cities, including in Mexico and the Caribbean are available on the website of the International Occultation Timing Association (IOTA) here. For more specific information regarding the location of the graze path relative to your location, you can see an interactive map of the path here. An expedition to observe this event from Utah is being led by Patrick Wiggins. He invites those who might be interested to contact him at paw@wirelessbeehive.com. Check out his website at: http://utahastro.info.